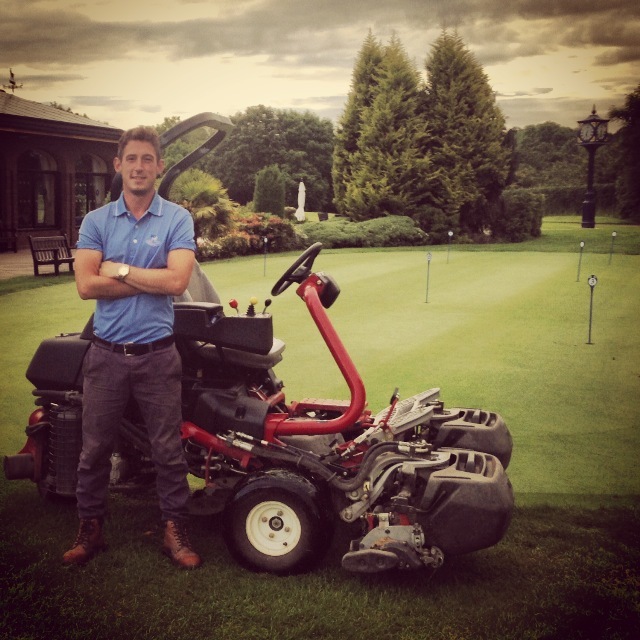 During my time at Redditch Golf Club, I have learned different techniques of aerification (from scarification to verti-draining). Each of these methods have their unique way to allow the root system to breathe. However, I recently took aeration to the next level. Instead of spiking the ground, or creating a vertical slit, I blew air into the ground to relieve the compaction... the results were mind blowing. ​The GP Air combines clever design with robust engineering, giving a cost effective solution for poor soil structure. 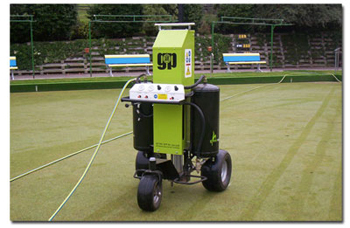 Using an exclusive air delivery system, the GP Air is perfect for initiating and maintaining a healthy soil environment. Compaction, water logging, bad drainage and anaerobic conditions are all factors associated with poor soil structure. These are every day battles for those tending them. This unique machine can penetrate deep into the soil, and aerate with little or no disruption to the surface level. Releasing a controlled blast of compressed air, the GP Air lifts and shatters the compacted layers of soil. This allows saturated soils to drain. It also allows water to infiltrate parched and dry soils. Soil structure determines the ability of a soil to hold and conduct water, nutrients and air necessary for plant root activity. It is the balance of soil matter, water and pore space that determines the health of the soil. Soil compaction occurs when soil particles are pressed together reducing pore space. Heavily compacted soils contain few pores and have a reduced rate of both water infiltration and drainage. Soil aeration affects compaction by breaking up the soil profile. The process of opening up the soil profile initiates a healthier soil environment, oxygenating the root zone, promoting the growth of beneficial soil organisms and enhancing the availability of nutrients. A simple diagram below of what we are trying to achieve on the tees. 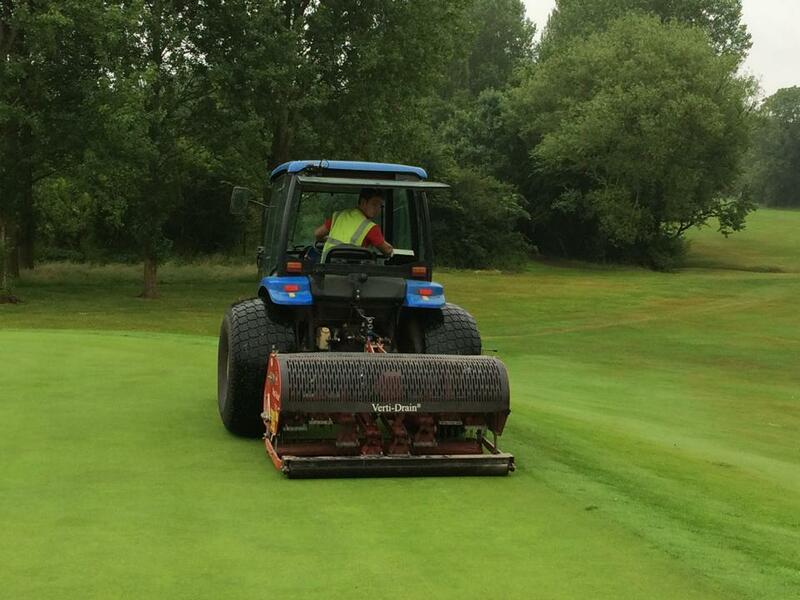 ​The GP Air is effective, yet time consuming, so it's not a machine we could use on the fairways. The ideal sports turf area for the machine would be the greens or tees, as we're going to be de-compacting the worst areas we can certainly cross the greens off the list as they are USGA spec....Tee's it is then. Navigate the GP Air up and down the tee, punching each hole with a metre spacing, staggering each line to ensure we get a consistent even spread. Like most areation work we create holes in the ground... sometimes, we then just leave the holes open, however most of the time we replace the nutrients we've taken out of the ground with either root zone or sand. On this occasion we'll be using a root zone amendment called Eco-Lite. Eco-lite is a natural Zeolite root-zone amendment that offers major, long term benefits for turfgrass. Holds water and nutrients in the root zone until grass plants are ready to use them. Reduces leaching of fertilisers, preventing pollution of ground water . Completely natural and non-toxic to plants and animals. I would like to say a massive thank you to Kim Blake course manager at Fulford Heath Golf Club for supplying us the machine for a couple of weeks. This is one of many connections through Karl Williams our course manager, who worked under Kim once upon a time. This machine will work wonders for specific areas. How to rake a Bunker.... in Style! 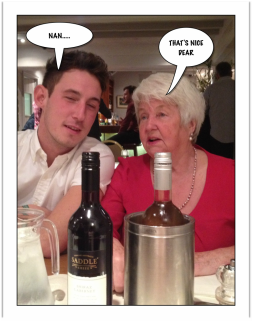 Last week we received a belated Christmas present from the golf club... what a good one it was too !! For the last 5 years or so, we've had to deal with numerous problems with our vert drain machinery ........ well not any more !! 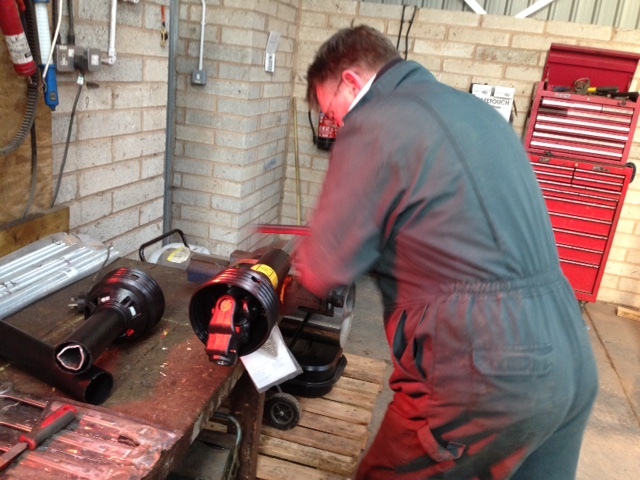 ​Chaz Ayres (Wiedenmann UK area sales manager) demonstrates how to cut a PTO shaft to size. ​Chaz also gave the whole team a demo on how to use the machine..
Our latest purchase, is the Wiedenmann Terra Spike Gxi 8 seen in the pictures above and below. 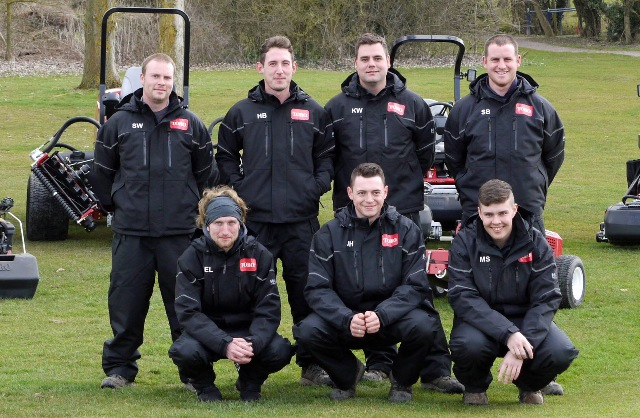 The principle of 'time is money' applies now more than ever to professional turf maintenance. The amount of time we have at our disposal is becoming increasingly limited while the players are placing ever more exacting demands on the quality of the turf. Regular deep spiking and deep aeration are important requirments for a healthy root growth. After decompacting the ground, the roots can penetrate deeper into the soil and thus make better use of water and nutrients. This improves water and air flow of the soil, eliminating thatch and enhancing the strength of the grass. ​However, despite all the technical innovations in the past, this type of maintenance work has always been a time-consuming task. The new generation of Wiedenmann GXi revolutionizes turf maintenance and sets new standards in speed, productivity, and quality of work. As you can see in the diagram above it clearly shows us the benefits from Verti-drainning..
From left to right, we have new sizes for the tines we will be using. 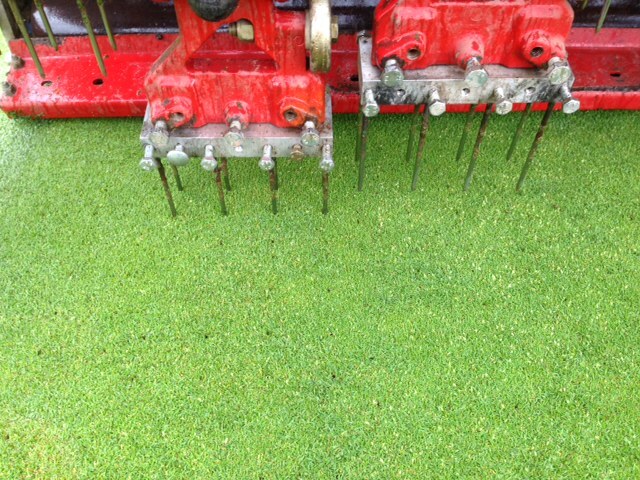 12 mm tines will be used on the tees, also ideal for the greens. 20 mm will be used for the fairways. I've not yet had the chance to give this machine a proper work out, due to the amount of frost and snow we've had in the last week....(at least its wasn't more rain). I can certainly say from the demo experience I had with Chaz and the guys, that the machine was like something I've never experienced before. From setting the machine up to washing it off and putting it back in the shed is simple and not time consuming. If you like Gavin and Stacy then you'll love these two video's below. Do you know it's christmas time yet?? ​If you like the video above, then please watch the video below, i guarantee you will have a laugh...i present to you, Harvlarr and Jammy. 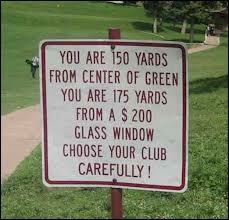 .....At redditch golf club you say??? We can all agree the start of July was was very hot, in fact it was Kenya, or should I say "Ah Zabenya". Well that's what me and the lads use for the meaning of hot.....Very hot. Due to this hot, dry period, you may have noticed at the beginning of the month that the greens and fairways were starting to suffer from the intense heat. However, the maintenance and work that took place to help prevent this from happening is shown below. The needle tines in the picture provide the smallest footprint (of any tines), whilst creating an environment for efficient gas exchange and water infiltration. These narrow tines are the ideal selection for turf requiring frequent aeration, especially during the warmer months. It improves the effectiveness of fertilisation. The blades of a verticutting reel are finer and more numerous than those on a scarifying reel. They are designed to be used above the thatch layer to remove dead and dying grass plants that will ultimately contribute to the thatch layer. It isn't mandatory that we do these two tasks before applying the wetting agent; however, to get the best results, doing so would improve the effectiveness of fertilisation. To sum this up, a wetting agent is a product that will help retain moisture in the plant (greens) when irrigated. We're using ....Revolution. This takes the work out of growing great turf from the bottom up. It works in the soil to stabilize moisture levels, balance air-to-water ratios and provide better access to nutrients in the rootzone. The improvement Revolution gives you in soil conditions lets the plant function at its greatest genetic potential. The result? Stronger turf throughout the season that will perform in all weather conditions. Revolution means you can control the amount of water you apply with irrigation when conditions are dry, and even when the rain won’t stop, Revolution will stabilise the moisture levels within the soil giving you an even surface of unrivalled playability. You must watch this video below featuring James, aka 'Wheres Jammy'. If you haven't already, please follow us on Facebook or Twitter! This month we have sprayed Primo maxx on the fairways. Primo Maxx reduces top growth while improving both sward density and root mass. It has a unique active ingredient which reduces vertical growth, increases food reserves and lateral stem development. Hence the name, growth regulator. More information about the growth regulator can be found in one of my previous bloggs.... August 2014 take a sneak peak. "Ohh, the fairways are looking good Harv!! Nice and long, I've never seen them like this before"
I told her what height we cut them at last year. "Are we cutting them higher then?" (baring in mind we used to cut the fairways at 20 mil and we're now cutting them at 14 mil). "Nan" I said, (haha)..."When you cut the grass shorter, you're encouraging the finer grass species to come through. This naturally creates lateral growth which makes the fairways seem longer than they are ....when they're not. The height is an illusion, caused by the amount of the grass coverage; cutting it shorter improves the sward density. Whereas before, we were cutting them at 20mil+. This meant that the longer species such as Rye-grass shadow the finer ones, leading to poor coverage on the fairways"........"
My point is , the fairways are really good at the moment due to cutting them shorter. We've only used one application of fertiliser, which proves cutting them shorter is really beneficial! What I'm trying to say is, the 1st application of Primo Maxx has been applied and I'm looking forward to seeing the results. The growth regulator had a massive impact on the fairways last year, so I can only imagine how good they will be this year as we continue the program. You must watch it now! I know..... it only took ﻿me﻿ one attempt ! Every Monday morning, JG (Greens Chairman) bursts into the sheds after playing golf over the weekend and says..."3rd on the right and 8th on the left" what's his first complaint? We all know its the usual.... the beloved bunkers. I went over to the States last year to visit my Auntie and Uncle who live on a golf course called Laurel Ridge (fantastic golf club), their biggest complaint is... you got it, Bunkers. 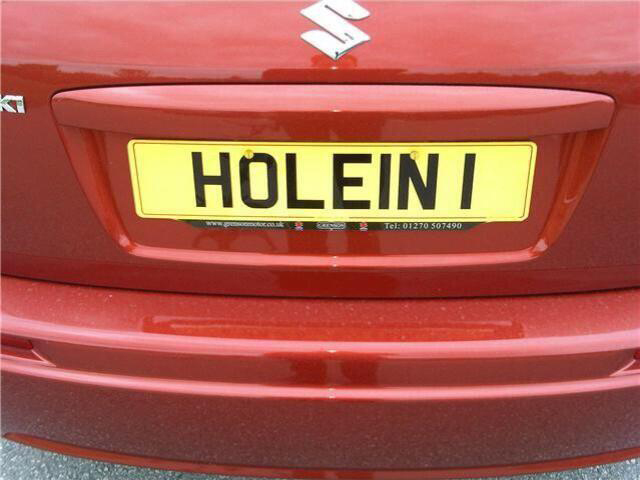 It's a known fact that it is every golf clubs biggest problem, so we need the golfers help! Here's one of the problems (shown below) located on the 13th hole. When James approached this particular one last Monday after one of JG's talks, his face looked like the picture below. He just couldn't believe how much sand was placed at the entrance of the bunker, he spent 20 minutes trying to correct it. The bottom left indicates how little sand is at the front of the bunkers. The reason for this is that when the golfers exit the bunker, they always rake backwards and not forwards. In a ideal world, I would love it if the golfers would push the sand forwards toward the pin. 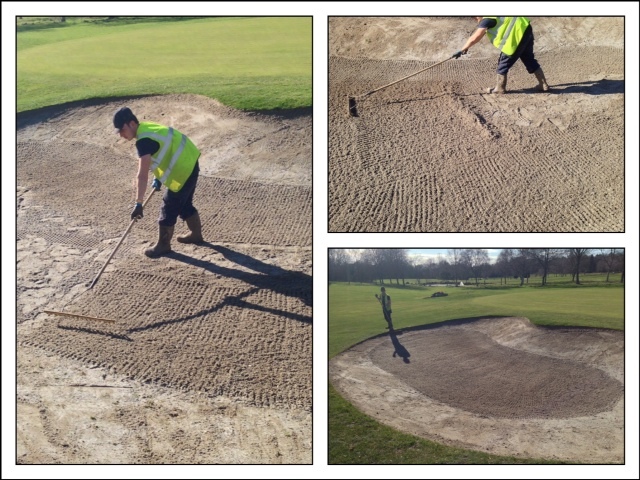 We move the holes twice a week so this raking method should help us evenly spread the sand throughout the bunker, thus making everyones life easier.... A tidy bunker is a happy bunker. I know you may think they're not great, but trust me we are trying to perfect them. After renovating a select few on the course, the improvements are dramatic. However, we need you guys to help us out, even if we are raking them every day. Here's a link to show you how much work were pumping into the Bunkers. When the raking is done, exit the bunker at the lowest point, raking the sand forward or towards the pin. Use the back of the rake to smooth out the footprints on the faces. This stops any loosening of the sand which causes plugging of the ball. 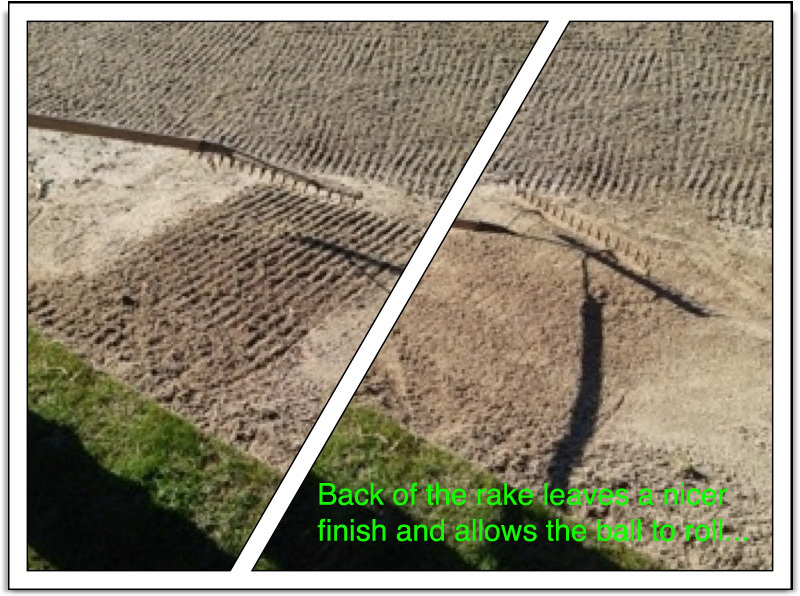 The aim of back raking the faces is to allow the ball to roll to the centre of the bunker, making it less difficult for the golfer to play the shot and less time consuming for us greenskeepers. We will be making a light hearted video soon about raking bunkers so please stay tuned ! Now on to some banter....I was reading the RGC news letter today and this tickled me pink..... read on!!!! 'Congratulations to Harvey Brooke, our Deputy Course Manager, another of his blog articles has been picked up by a golf magazine and will be featured this coming month. To view Harvey's blog look on our website under 'golf' or go to www.greenkeepersblog.com If you haven't yet read it, it's well worth a read. That's no-se joke guys ! northern ireland open quALIFYING round! It's been almost a year now since I worked at the Royal Liverpool for the British open and I can honestly say that it was the best experience I've ever had...... until now !! This time last year I was preparing for the biggest day in my working career. I never would have thought that I'd get the opportunity to work alongside some of the best greenkeepers, let alone walk down the fairways with the best golfers in the world ....raking the bunkers that is, not playing. However, this experience was recently trumped by having the priviledge of hosting the Northern Ireland qualifying round at my home club, where I have passionately worked for the last 8 and a half years. The day was a great success, all bar the poor weather in the morning - and having to wake up at 3am! Nevertheless, the early mornings and late finishes were definitely worth it and I thoroughly enjoyed every second of it. I'm very happy to have Karl as our Head Course Manager, and I now really appreciate the amount of organisation that goes into such an event, and I'm also proud to be part of such a diligent greens team. I'm not saying that we don't always work hard; however, two weeks and the whole build up to this event completely shattered the team. We ended up working double shifts which started at 5am -10 am and back again on the same day from 5 pm until 10 pm. I've never experienced anything like it, the shifts we were working just before the event I actually think people were getting fed up with the massive grin on my face. We are serious pros here at Redditch.... having said that, the greens chairman JG put in a massive shift to help us out, which we are all very grateful for. In fact, he did such a fantastic job that we have all nominated him to do that from now on and forever more.. ha ha!! 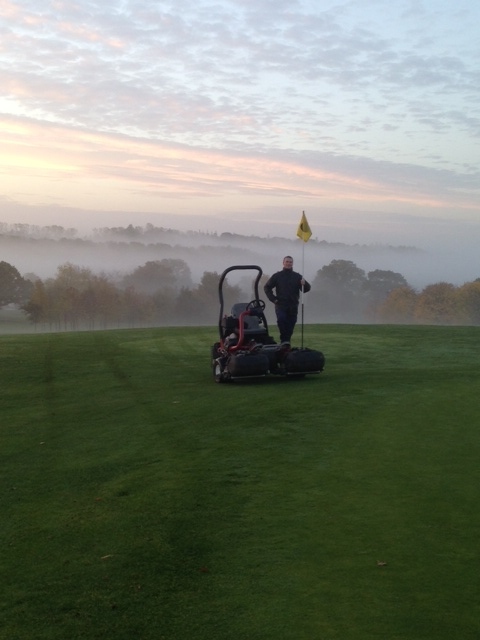 Two cutting the tees and aprons (the same height of cut), one cutting the collars, another cutting the surrounds and one on the rough, the greens were then cut and rolled or should I say ironed in the mornings, as the holes were moved simultaneously. It was pure bliss seeing the team working on one hole at a time and i can't wait to have this competition back next year. I have put together a little slideshow below with some of the best pictures of the day, credit to James Harrison for following the golfers around and getting some great snaps. 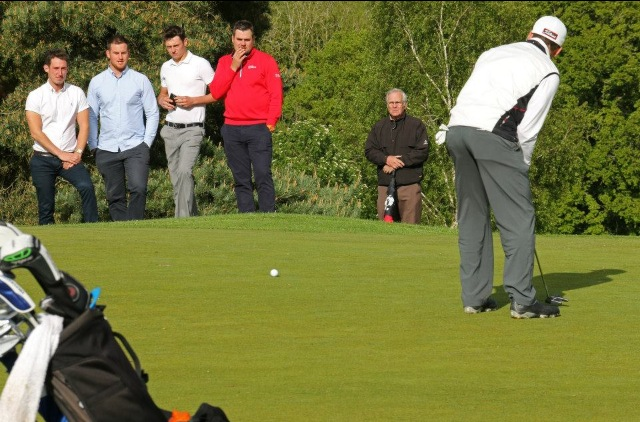 Over 60 professionals battled it out at Redditch Golf Club, Worcestershire with two spots up for grabs in the 2015 Northern Ireland Open, in association with SPHERE Global and Ulster Bank. Heavy rain met the early starters, but Luke Towler (Telford Golf & Country Club) sealed his place in the European Challenge Tour event with a superb 2-under 70 in the worst of the conditions to lead the field. As the day wore on, the rain eased and the wind picked up; nonetheless, it was two more early starters who joined Towler with scores under-par. Billy Hemstock (Teignmouth GC), fresh off a second place finish in the PGA Europro Tour’s World Snooker Open last week and Ryan Evans (Wellingborough), who finished T-25th in the Made in Denmark Challenge over the weekend both shot 1-under par 71s and with no other players breaking par, a playoff would decide the second spot. Both players parred the first four playoff holes with Evans eventually sealing his spot in the 2015 NI Open via a birdie on the fifth hole of sudden death. 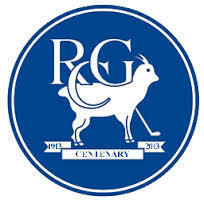 A special mention must go to Redditch GC, who put on a superb day with dozens of volunteers making the first Northern Ireland Open Pre-Qualifier in England a tremendous success, played on a course in superb condition. I just want to say a big thank you to all the people who have helped out with devoting and pitch repairing, especially Steve Hadley and John Daws. You have been a massive help guys, the green staff and I really appreciate it!